Willie got a big push from Natalie Decker out of turn two and he gave a few taps to Self’s bumper. Self got sideways and spun and Willie was forced off the track and into the grass, where the car came to rest in turn three. I watched as the crew scattered to gather tires and anything else they thought they might need as Willie limped his damaged car back around the track. He pulled in the pits and the front splitter was bent under the car, which was not a good sign. The first crew member opened up the hood and he quickly signaled they were done. It wasn’t until after I got to the garage that I found out how bad the damage was. The incident and subsequent trip through the grass had done a bunch of damage in the engine compartment, including knocking the radiator out of the car and potentially hurting the motor. Willie’s race was over before it had really begun. To Willie’s credit, he quietly went to work with his team tearing down the car and preparing it to be loaded on the hauler. I stayed back, choosing to watch rather than ask Willie what happened. It wasn’t until we got back to the house he and Dinah had rented for the weekend that I felt comfortable asking Willie what happened. “It’s one of those things,” Mullins told me. “We were in a tight pack and we were pushing and pushing. I guess Natalie was up against me and I was on the brake pedal hard cause I was on Self a little too hard and then it got him loose and then turned him and we just got into it together and tore up both cars. He was disappointed. Dinah was disappointed. It’s understandable. But what I also heard from members of his crew — including crew chief Tony Furr and spotter Kevin Belmont — was encouragement. Both told Willie that what he and his volunteer team had done was impressive and he should be proud of what his team accomplished. To his credit, Willie said none of this could have happened without his crew. 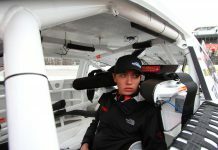 “We have Tony Furr with us, a longtime Cup crew chief, and he and I were talking pretty good in the car,” Mullins said. “He was very proud of the effort that all those guys gave being volunteer crew. He said he’s been with crews that are volunteers and it’s a joke. He said that we’re serious. With that, Willie and Dinah loaded up their car and drove back to the hauler. They had 12 hours of driving to do in the hauler to get back to Virginia, where Willie was going to be back at his day job Monday working on trash trucks.